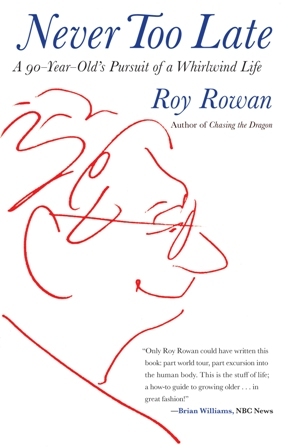 Never Too Late is career correspondent and author Roy Rowan's rousing testament to the fact that if you are still in reasonably good health and have a career or set of interests to pursue, your swan-song years can be among your most productive. He shares his views of the pleasures and potentials of old age based on a long life of adventure - from his decades covering wars and revolutions across the globe to the jogging that took him through his eighties and the fishing that fills so many of his days as a nonagenarian. Throughout he weaves in the lessons he has learned along the way and addresses a spectrum of topics, including the subjectivity of the label "old," the importance of optimism, and the fight to maintain independence as the years go by. He also encourages retirees to start a second career or activity, naming the three E's of Enthusiasm, Exertion, and Energy as the keys to pursuing a new passion. Never Too Late is one man's stirring reminder that the philosopher Satchel Paige had it right when he asked, "How old would you be if you didn't know how old you are?"